PLAY PUMP: The Merry-Go-Round Water Pump! It’s no secret that access to clean water is one of the most fundamental requirements for healthy individuals and thriving communities. The PlayPump system is bringing clean water into the hardest hit regions of Sub-Saharan Africa. There’s only one catch–users have to take a spin on the merry-go-round! The PlayPump has been installed in rural villages and primary schools where kids can easily access the fun, all the while pumping clean, potable water from underground up into a 660 gallon water tower above. A few hundred yards away, a spigot supplies fresh water for the whole community. The water is then used for drinking, cooking, sanitation and even growing vegetables. PlayPumps come with 10 years of guaranteed maintenance supported by the advertising space on each water tank. Two of the four panels are sold to local advertisers promoting only products and services appropriate for primary school audiences. The other two panels are reserved for public service announcements. These provide information on hygiene, HIV, AIDS, and other health-related issues. The implications of bringing fresh water into a community go far beyond drinking and sanitation. Many women and girls in rural Africa can walk for hours each day to fetch water passing through vulnerable and unsafe regions. A local pump allows them to stay home and care for younger children, work a job, attend school, grow vegetables or build a business. This opens up immense opportunities for women and girls in Sub-Saharan Africa to achieve their greater potential. Fresh water also means that it doesn’t need to be boiled first, which drains precious resources such as gas or firewood and degrades the environment. Families with access to clean water are also much more able to achieve self-sufficiency by growing their own produce and maintaining local businesses. The PlayPump system has created dozens of jobs locally and continues to spawn social and economic development. 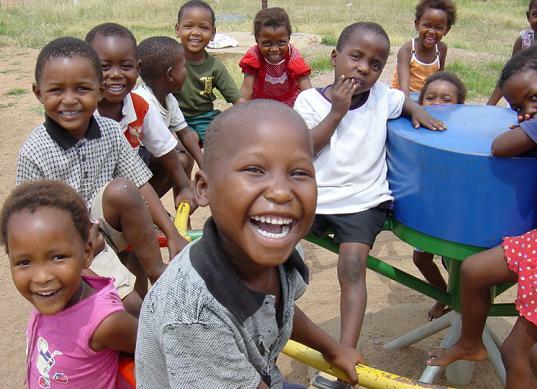 So far, over 1,000 PlayPumps have been instilled in South Africa, Lesotho, Mozambique, Swaziland and Zambia. PlayPump International plans to bring that number up to 4,000 by 2010, supplying as many as 10 million people with fresh water and a fresh start. Love to hear about ingenious designs that truly benefit communities in need. Kudos to the designer! It is so appropriate for less income countries. Do you have sketches or blueprints that NGO's like us can purchase? Thank you. Job Ebenezer, Technology for the Poor. It is a beautiful design,I am a Kenyan student and considering to do the project on the same! The design will help a great deal in providing water to those living in rural areas. Story surprised me. They talk about ads "appropriate for children" and then mention other community service announcement re HIV & aids. How is that appropriate for children? My engineer rekatives said a follow0up story said they didn't hold up well under use. Need redesign? Um, be careful with this model. There is currently a playpump where I am living in Malawi, it has worked maybe 1 month out of 7. We had it fixed a week ago and it is broken again. From what I saw, the pipes under the equipment are moving up and down with no support, causing them to become damaged. Also, why only 10 years of maintenance support, what does the village do after that? Is that sustainable for generations to come, which is the prupose here, right? Because it is installed by a contracting company, the village gets no local support from the water district, leaving them at the mercy of a company located out of the area for maintenance. Also, the number on the side of the water tower for "free maintenance" is a number that is out of service. Because of these issues, the village has had a major out break of diarrhea and villagers are digging for water in a near-by wetland. Research issues with playpumps, you'll also be surprised at the outrageous cost of this equipment. This design looks awfully flimsy, and not that efficient. Someone should look into the design of the Pull-A-Way merry-go-round that was formerly built by GameTime many years ago. You sit on them and work a set of bars back and forth with your hands and feet to make it go. Very easy to propel, and some of them that weren't destroyed to make playgrounds "safer" are 60+ years old and still working. I've collected some photos at http://myweb.wvnet.edu/~marizel/carousel/ if anyone is interested in seeing what it looked like. It's no secret that access to clean water is one of the most fundamental requirements for healthy individuals and thriving communities. The PlayPump system is bringing clean water into the hardest hit regions of Sub-Saharan Africa. There's only one catch--users have to take a spin on the merry-go-round! The PlayPump has been installed in rural villages and primary schools where kids can easily access the fun, all the while pumping clean, potable water from underground up into a 660 gallon water tower above. A few hundred yards away, a spigot supplies fresh water for the whole community. The water is then used for drinking, cooking, sanitation and even growing vegetables.